A tweet from a tipster with the handle @OnLeaks says that the LG G4 is going to feature a 5.6-inch screen. 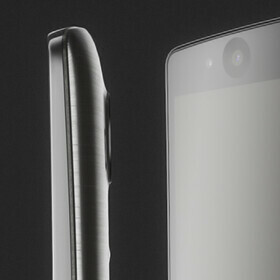 That would represent a slim .1 inch increase from the size of the screen on the LG G3. We expect the resolution to remain at 1440 x 2560. We don't expect to see the LG G4 introduced until May. The current flagship model was unveiled on May 27th, 2014. The LG G4 will feature a 64-bit octa-core Snapdragon 810 under the hood. We could see a 16MP-20MP rear camera on the handset with OIS still included. Most likely LG will stick with 3GB of RAM and 32GB of native storage. This year, LG will apparently have something even bigger up its sleeves with the LG G4 Note. Early speculation has the device earmarked for the second half of the year, carrying a 5.8-inch display. This model is apparently being considered as a challenger to the Samsung Galaxy Note 4, and will be offered with a stylus that might be called the G Pen. We are headed that direction...point still stands, though. a phone with 5.6" screen from LG is just an equivalent to a phone with just 5" screen from other manufacturers. No it isn't. Even the super thin bezel if G3 made it about 74.6 mm wide. We can easily expect this to cross 75 mm. Now the m9 is 69.x mm and the S6 is 70.x mm. They are much smaller. Note 4 is 77mm. I was waiting for G4 but looks like I'll pass on this one too if this is true. Anything greater than 70 mm is a no go. LOL. If the battery life of S6 is decent, I might go for it(not the edge). The thinness makes up for the 0.5-0.6 mm as they are much thinner than rest of the phones and decrease the overall circumference. you don't get it! the point is LG can make a phone larger screen but almost the same overall in size with other phone with smaller screen. also don't forget to think G4 is a curved phone meaning its more ergonomic and feels comfortable in hand than other phone that has flat back! 75 mm width is huge, 5.6" or not. The other 5.5" phones are bigger but this is still much more bigger than 5" phones and hence too big for one handed usage. -An LG G2 owner. LG G2 is 70.9 wide? No. People want a phone they can use one handed, not a tablet in their pocket. Your brain is small. I agree that 70mm is the WIDEST I would ever want my phone. 67mm is the sweet spot. My hands are not small. I can use a g3 with one hand if I move the phone in my hand. But I want a firm + want to reach the top corner. That's not possible with a 5.5 inch screen. That's almost a Note 4 LOL. Noting this year will be better than the galaxy s6. The next best phone to dethrone the s6 is only the S7. The s6 is a next year device. LG HTC Apple were all not ready. S6 is good all-rounder device, if not the best. S6 hefty price tag may be a reason for some people including me to consider LG G4. How about the NOTE 5 ? S6 has best SoC, display, slim metal and glass body, arguebly best camera, fastest NAND and fastest RAM. M9 has metal body and front facing stereo speaker. Probably Z4 will have water resistance, long battery life and slim body. What's left for G4? Slimmer bezels would be good. G3 was not really improvement over G2 in that area. G3 size display on near G2 size body would be nice or 5.7 inch display on G3 size body. Also G3's battery life wasn't good after G2. Maybe they have to be switched to OLED and FHD. I don't know how does their OLED against Samsung's AMOLED. Maybe they could catch some people from Samsung for user replacable battery. I would knock NVIDIA's door for an underclocked Tegra X1 possibility. If I don't get it wrong when it's GPU underclocked to Apple A8X level performance, power consumption radically reduced. Probably it will have even higher resolution, maybe bigger screen. I predict same s**tty battery as G3 at best. And I agree, sammy truly innovated with a brand new amazing 14nm cpu, brand new flash memory, first phone ever with DDR4 ram. Most of other OEM's just pick from the shelf parts and make their own designs. On the other hand sammy and apple actually design most of their tech thats inside the phone. Why are people saying Samsung was first with DDR4? LG G Flex 2 was first, then came Xioami Note Pro (4GB even! ), and HTC One M9 with some hours. Samsung fanboys are turning into mindless people saying Samsung was first with everything and not even checking facts. This is what people were calling Apple fanboys mindless over. Congratulations, you guys are the next generation of blind worshippers! first ddr4 ram bla bla bla. gflex2 was the first one. And check battery life of s6 in gsmarena test. its pathetic for a 2015 flagship and 14nm cpu doesnt help this tiny 2550 mAh battery. Are you guys keeping track of these people to see how accurate these "tipsters" are? These guys have been off recently.